One among the 108 Divya Desams of Lord Vishnu and also named by the people as "Heaven in Earth" (Boologa Vaikuntam) is Tirumala Tirupati. Lord Balaji, an incarnation of Lord Vishnu staying in this abode and bless the devotees daily. This is the one of the most famous temple in India because many devotees believed that their prayers are satisfied here. Two years back, some devotee performed Lord Balaji Marriage (Celestial Wedding) in Madurai Tamukkam Ground. Lots of devotees attended the gracious occasion on that day. Likewise, the same thing happened in Kanyakumari District on Sunday, February 28, 2010. 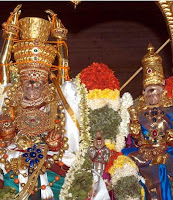 Before going to Kanniyakumari, Lord Balaji along with Sri Devi, Bhooma Devi, Alamelumanga Thaayaar, Aandal (Utsava Moorthies) visited Madurai on Saturday, February 27, 2010 by evening 4'0 clock. Almost four hours Lord Balaji stayed in front of the Madurai Meenakshi Amman Temple and departed from there by 7.30 p.m. That's really a great news. After hearing the news, lots of Madurai devotees reached Meenakshi Amman Temple and welcomed Lord Balaji and got His blessings. Madurai Devotees are very lucky indeed. Recently I came across the websites which is mentioned that the Mayan calendar predicts that the Earth will end on December 21, 2012. Scientific experts from around the world are genuinely predicting that five years from now, all life on Earth could well finish. Some are saying it'll be humans that set it off. Others believe that a natural phenomenon will be the cause. And the religious folks are saying it'll be God himself who presses the stop button. You people share your thoughts, suggestions and opinions in the comment section of the post. Please don't make it spam. A huge life-size bronze statue of height 2.6 meters for Actor Sivaji Ganesan is established at Madurai. The most prominent actor "Nadigar Thilagam Sivaji Ganesan" statue unveiled on Sunday, October 04, 2009 near Raja Muthaiah Mandram, Madurai. Sivaji Ganesan is a well known popular actor in the tamil cinema industry who impressed many people in tamilnadu by his stylish action and rich tone voice. The Union Minister for Fertilizers and Chemicals Mr. M.K.Azhagiri opened the Sivaji Ganesan statue at Madurai. Actor's son Prabhu, Ramkumar participated in this statue opening ceremony. Also the most famous personalities of tamil cinema world Vijayakumar, Napolean, Kamal Haasan, Vadivelu, Manorama, Direcotr P. Vasu and Sasikumar grace this function. The Chennai's leading jewellery shop "Lalitha Jewellery" will be opened its new branch in Madurai, Temple city. The grand opening ceremony will be on Sunday, September 20, 2009. The Central Minister, Son of Tamilnadu Chief Minister and Chemicals and Fertilizers Minister Mr. M.K. Azhagiri and Mrs. Gandhi Azhagiri would inaugurate the opening ceremony and preside over the function. The showroom is named as Lalitha Jewellery Mart India Private Limited. "Lalitha Jewellery and City Center" showroom is constructed around 55,000 square feet situated at South Masi Street which is the heart and center of the Madurai Temple City. It is a four floor showroom on which two floors for Jewels selling consists of Gold, Diamond, Silver and Platinum and other floors for Textiles, Home appliances, Cosmetics and Stationery items trading. Apart from this, the showroom have sufficient space for customer's vehicles parking. As we all know that Madurai city is famous for Meenakshi Amman Temple, an ancient heritage temple in South India. 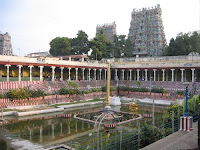 In spite of its temple features, Madurai city is well know for some tourism spots also. 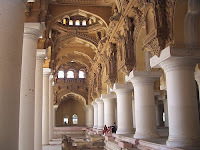 Among them, Thirumalai Naicker Palace (Thirumalai Naicker Mahal) is a famous one where tourists often visited this place while come for Madurai. In order to look the temple city grand and to beautify the mahal, Thirumalai Naicker Palace is renovated at a cost of Rs. 3 Crore and also constructing "Eco-Park" a.k.a. "Grass Paved Platform" surrounding the Palace. This will attract the tourists more and also make the palace with splendid appearance. Thiruvanandal Puja - 5.00 A.M. to 6.00 A.M.
Vizha Pooja - 6.30 A.M. to 7.00 A.M.
Kalasandhi Puja - 7.30 A.M. to 8.30 A.M.
Thrikalasandhi Pooja - 10.30 A.M. to 11.30 A.M.
Uchikkala Puja - 11.30 A.M. to 12.30 P.M.
Maalai Pooja - 4.30 P.M. to 5.00 P.M.
Ardhajama Puja - 7.30 P.M. to 8.30 P.M.
Palliarai Pooja - 9.15 P.M. to 10.00 P.M. The tenth day of Avani Moola Maha Utsavam is going to be held at Madurai Meenakshi Amman Temple Old Thirukkalayana Mandapam at 4.30 p.m. on Tuesday, September 01, 2009. This is the one of the interesting Thiruvilayadal performed by Lord Sundareswarar in Madurai to preserve a famous vocalist in the Pandiyan Kingdom. The Leela is known as "Viragu Vitra Leelai" (Lord Sundareswarar Himself traded Firewoods in Madurai streets to save His devotee Baanapathiran). During the Varaguna Pandiyan ruling period in Madurai, a singer named Hemanathan from north side visited Madurai and sung various songs and got prizes. Hemanathan said to King with bigheaded voice, is there any vocalists in this kingdom to beat me. Suddenly, Asthana Pandithar Paanabathirar striked to King's mind. King also accepted the Hemanathar's challenge, but Paanabathirar felt that he was not suitable to beat Hemanathan, so he surrendered Lord Shiva and requested to preserve him and Pandiya Kingdom. Lord Sundareswarar accepted his request and came to Madurai city streets as a Firewood trader humming songs. At night, Lord Sundareswarar (Firewood Trader) sung songs at Hemanathar staying place. Hemanathar forget himself on receiving Lord's songs. Then Hemanathar asked the Firewood Trader, from whom you learn the songs. Firewood Trader replied that the great vocalists "Asthana Pandithar Baanapathirar" taught me. Hemanathar shocked and immediately left that place and also written in a leaf that he and his abilities everything bestowed to Paanabathirar and Pandiyan Kingdom. The eighth day of Meenakshi Amman Temple Avani Moola Festival is "Nariyai Pariyaakkiya Leelai" on Sunday, August 30, 2009. Nari -> Fox and Pari -> Horse. Lord Sundareswarar (Lord Shiva) always performed various Thiruvilayadal to save His devotees and saints from the critical problems and dangers. Likewise, He transformed the foxes into horses to save one of His devotee and major Nayanmar "Manickavasagar". During the period of Arimarthana Pandiyan ruling in Madurai, King gave gold to Manickavasagar and asked him to buy horses. Manickavasagar went to buy them, but on the way Lord Shiva came in the form of Lord Dakshinamoorthy and preached Upanishads and Vedas to him. Afterwards he spent his whole time in chanting Mantras and devotional songs about Lord and forgot to buy the horses. King was waiting for the horses, but nothing happened. So he asked his soldiers to contact Manickavasagar and asked him about the horses. Then only Manickavasagar remember about it, immediately he surrendered Lord Shiva. God never ignored His devotees. At that time, Madurai was a dense forest (also known as Kadambavanam) fully consists of wild animals and foxes. Finally, Lord Sundareswarar convert the foxes into horses and brought them to the King's palace and protect His devotee Manickavasagar. The 4th "Book Festival" starts from today (Saturday, August 29, 2009) at Madurai Tamukkam Ground. The south india book publishers and sellers jointly conducting this festival. There will be 227 book stalls and around 1 crore books available. All kinds of books which could help from childhood to senior citizens like science books, technical books, general books and everything will be available. This festival is both for the book exhibition and book sale. Offers 10% discount for the buyers. 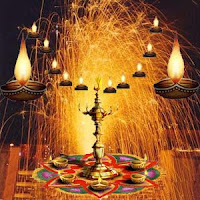 The seventh day of Avani Moola Mahotsavam is "Valaiyal Vitra Leelai" which is to be held on Saturday, August 29, 2009. 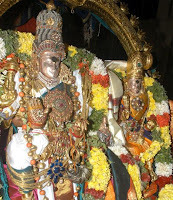 Another important function is Lord Sundareswarar's Pattabhisekam will be held on Madurai Meenakshi Amman Temple tonight between 7.30 p.m and 7.50 p.m. As I have discussed earlier in my previous post, Meenakshi Amman rule Madurai from the tamil month of Chithirai to Avani and Lord Sundareswarar rule from Avani to Chithirai. So today onwards, Lord Sundareswarar starts to rule Madurai after the Meenakshi Amman ruling. The notable feature of this Thiruvilayadal is that Lord Sundareswarar himself sold bangles. This event will be happened at Madurai Valaiyalkara street at 10 a.m. After that, special pujas will be made to bangles and bring them to the Lord's shrine. 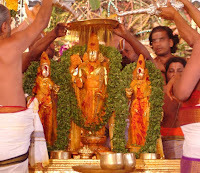 The sixth day of Avani Moola Utsavam festival is "Baananukku Angam Vettiya Leelai" held on Friday, August 28, 2009. During the Kulothunga Pandiyan period in Madurai, there was a couple named Virudha Veeran who was very old teaching various fights to students and beautiful young-age Manicka Maalai. At that time, Siddhan alias Baanan joined there to learn fights. He wished to become a great coacher like his tutor. Guru's wife should be treated as mother, but he had a lust on his Guru's wife instead. So, he asked his Guru to battle with him. Due to his body conditions and aging, Virudhaveeran not able to battle with him. Hence the couple surrendered Lord Sundareswarar, God came in the form of old-age Virudhaveeran and fought against him and demolished Baanan's body parts individually. Hence this Thiruvilayadal is called as Baananukku Angam Vettiya Leelai. Indian Tour Packages - Classictajtours.com is a travel company in India, which offers India Tour Packages for the people planning trip to Golden triangle India, North India tours, Rajasthan tour and Delhi, Agra, Jaipur tour etc. Spring Break Deals - Inertia provides Cheap Spring Break. It provides all sevices just like food, transportaion and hotel faclilities in very less prices. You can also enjoy parties. Get the Widgetbox Blog Network: Religion widget and many other great free widgets at Widgetbox!